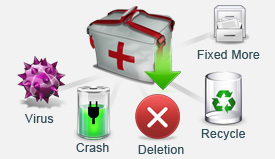 * Recover All situations: Deleted, Formatted, Erased, Corrupted and more. 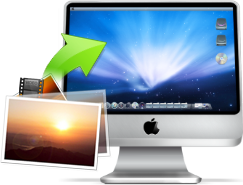 * Deletion Recovery and Deep Recovery fully recover photos from Mac. * Thumbnail preview lets you check photos pre-recovery. * Read-only application; doesn’t overwrite or modify the original data. * Recover photos from Mac and most storage devices. * Compatible with Mac OS X 10.11(EI Capitan), 10.10(Yosemite), 10.9, 10.8, 10.7, 10.6, or 10.5. Tip: You are recommended to choose Data Recovery for Mac if you need recover more file types. Photo Recovery for Mac: Rescue photos from any storage device or digital camera. This Jihosoft Mac photo recovery software tool lets you recover all your lost, deleted, formatted and inaccessible photos, videos and music files from your Mac or other storage device. It provides complete photo recovery from any Mac-based hard drive, iPod, USB drive, external hard drive, digital camera and other storage media. With an easy-to-use interface, even novice users can recover photos on Mac with great ease with just a few mouse clicks. • Lost File Recovery – Recover deleted photos, videos and music files only on Mac hard drive with HFS+ file system. • Raw Recovery – Deep scan and recover lost photos, videos and music files from both Mac hard drive and other portable storage devices with HFS+/FAT/ NTFS/NTFS5 file system. * Recover not only images, but also video and audio files.Recover photos both from Mac and storage media such as hard drive, iPod, digital camera, flash cards, etc. * Most photo recovery software Maccurrently on the market can only recover photos from media storage. * 2 special designed Mac photo recovery modes- Deleted Recovery and Deep Recovery have enhanced the recovery experience on Mac. * Most data loss scenarios are covered Recover photoslost due to accidental deletion, formatting, improper device usage, virus attack, software crash, and other reasons. * Preview of images and camera RAW files before recovery lets you evaluate recovery quality in advance. 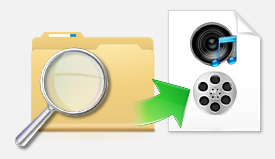 * Recover deleted photos from Mac with original file names, shooting dates, and storage paths. * Precisely search your recovery results for the specific file names you need. Mac OS X (including MAC OS X 10.4, Mac OS X 10.5 Leopard, 10.6 Snow Leopard, Mac OS X 10.7 Lion, Mac OS X 10.8 Mountain Lion, Mac OS X 10.9 Mavericks, Mac OS X 10.10 Yosemite, Mac OS X 10.11 EI Capitan) on iMac, MacBook, Mac Pro, MacBook Air, MacBook Pro, etc.